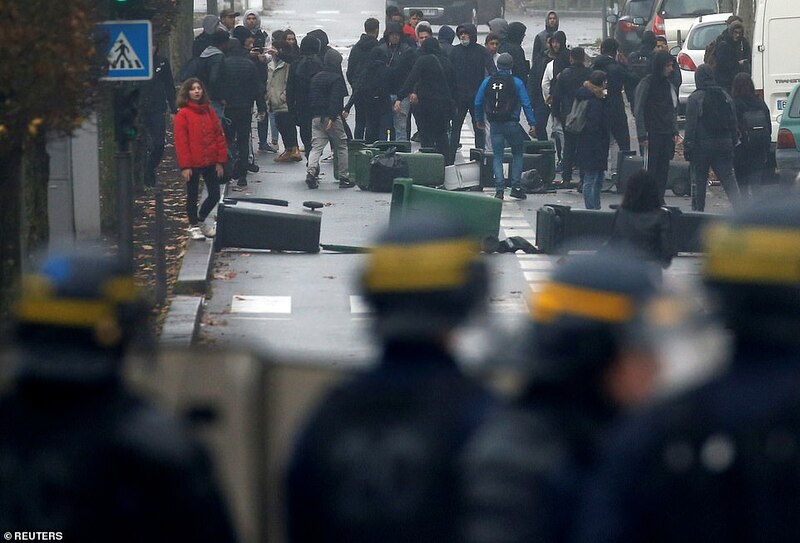 Emmanuel Macron’s popularity has crashed to its lowest ever and lawmakers are discussing a vote of no confidence in the French President’s government amid fresh riots across the country today. The 40-year-old head of state’s popularity rating fell below the 20 per cent mark as thousands of so-called Yellow Vests continued to demonstrate against his administration today. Some 200 high schools were blocked or disrupted by students protesting a raft of education overhauls, on a fourth day of action. 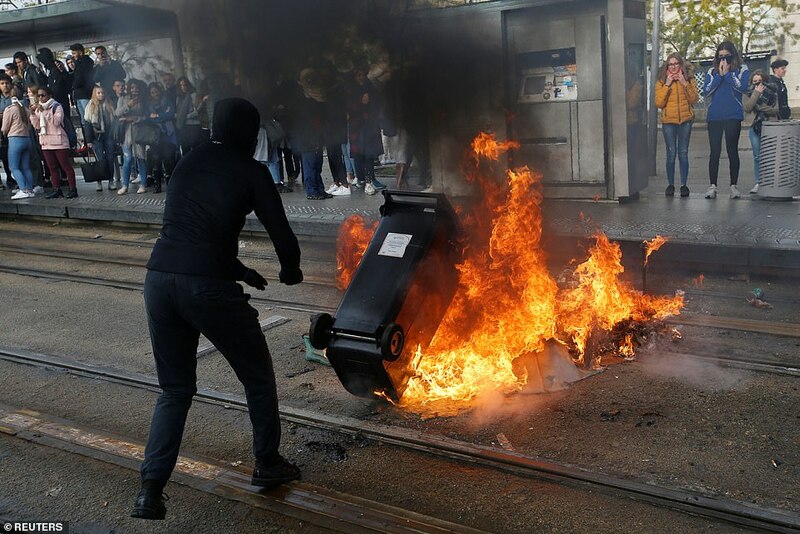 Dozens of people wearing face masks threw Molotov cocktails, torched trash bins and clashed with police in several cities during violent protests. 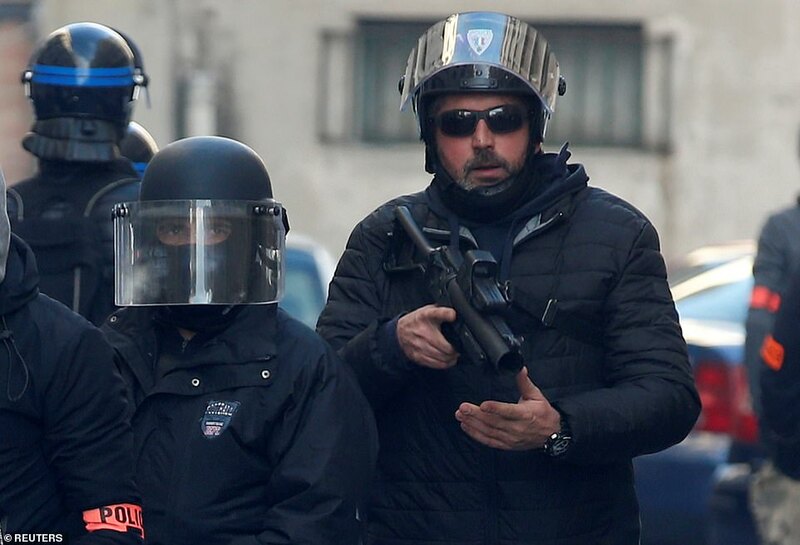 A spokesman for Mr Macron warned of ‘great violence’ this weekend and Prime Minister Edouard Philippe said ‘exceptional measures’ would be in place in addition to the deployment of 65,000 security officers across France. Paris police has also urged shops and restaurants on the Champs-Elysees to close on Saturday. 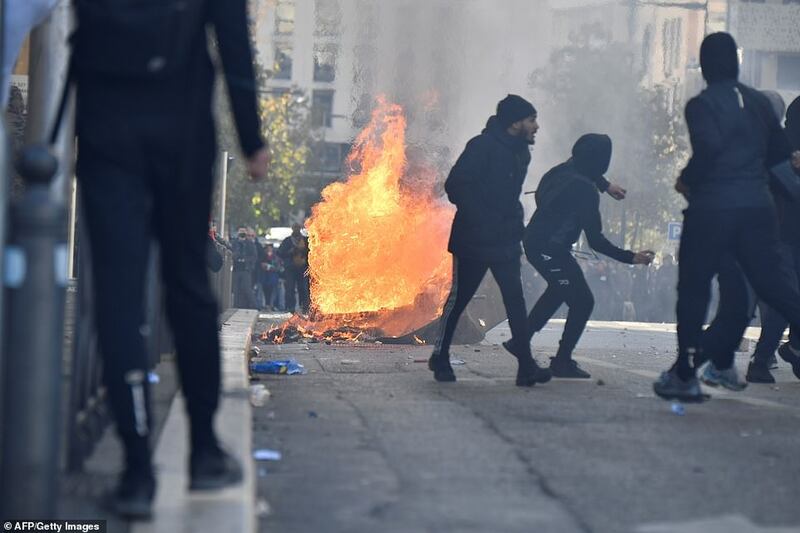 Earlier, left-wing opposition parties revealed they were seeking a no-confidence vote in Macron’s government amid growing protests and fears of violence. The left-wing parties alone don’t have nearly enough votes to bring down the government, since Macron’s centrist Republic on the Move party has a strong majority in the 577-seat house. But they are trying to attract support from other opposition forces. The move is a new swipe at Macron and his government, dramatically weakened by weeks of ‘yellow vest’ protests. 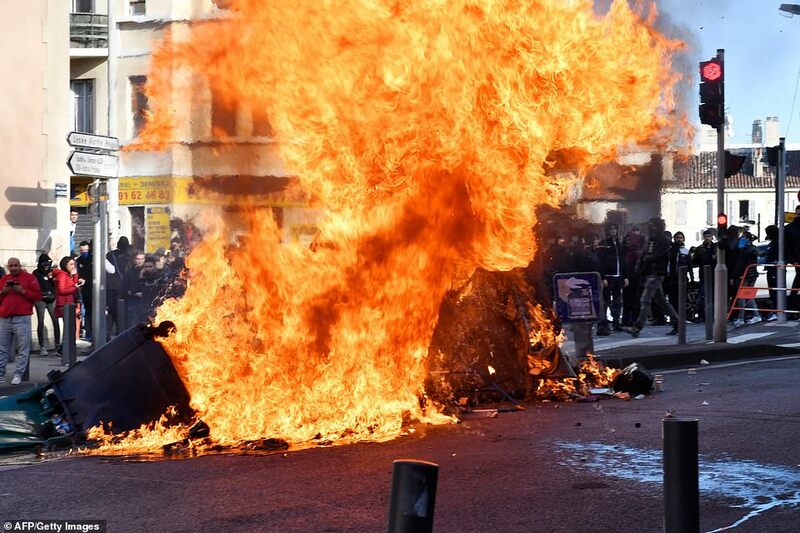 Despite a humiliating government U-turn on proposed green taxes on fuels, the Yellow Vests sense they can achieve more. The group is named after the high visibility jackets that all motorists have to carry in France, and originally called for a reduction in the price of diesel and petrol. Now disgruntled groups from Left and Right, including students and emergency workers, have joined their campaign. This has ensured that Mr Macron’s approval rating is now just 18 per cent, according to a new poll by YouGov for France’s HuffPost and Cnews outlets. 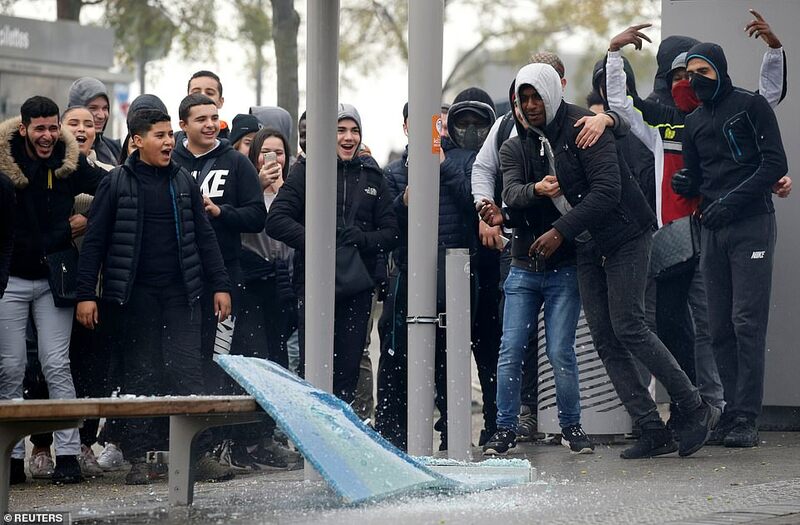 It was conducted the day before Saturday’s riots, with 1,006 people making up a representative sample of the French population quizzed. The 18 per cent figure represents a drop of three points, and the third consecutive decline in three months. Mr Macron came to power in May 2017 as an independent, pledging to reform the country’s sluggish economy and to introduce ecological measures in line with the Paris Climate Change agreement. But the former merchant banker is now described as ‘The President of the Rich’, and widely disliked. Macron issued an ‘appeal for calm’, as another day of action is planned for Saturday, not just in Paris but in other major cities and towns. 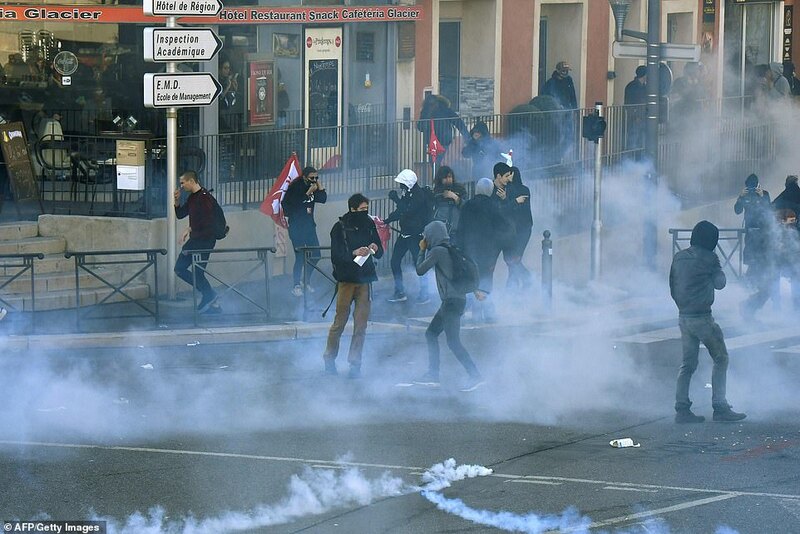 Horrifying images of French police beating up protestors have emerged, and these have inflamed an already hugely tense situation. Macron’s prime minister, Edouard Philippe, said: ‘What is at stake is the safety of the French people and our institutions. I call for responsibility. 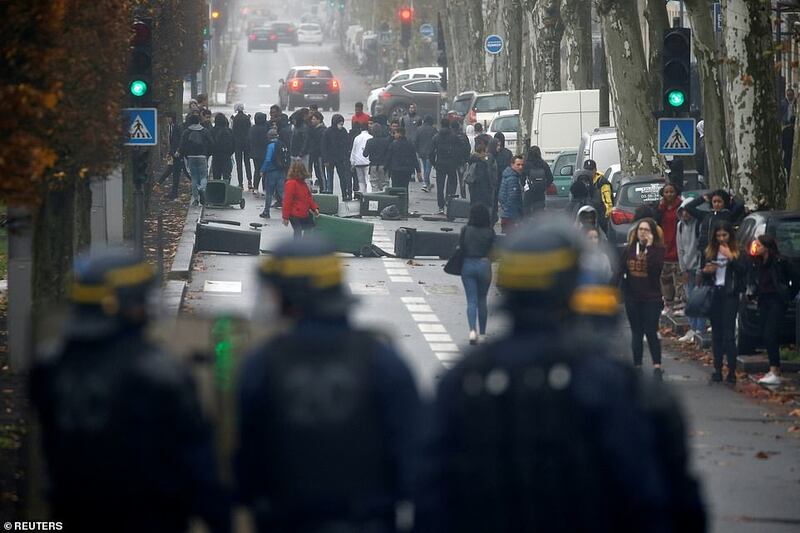 Social media is currently full of appeals for people to mass around the Champs Elysees in Paris on Saturday, to create disorder. 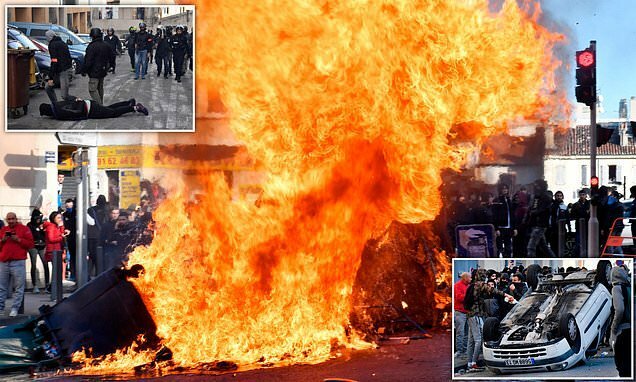 It will mean the fourth day of disturbances in a row, leading it to be dubbed ‘Act 4’. 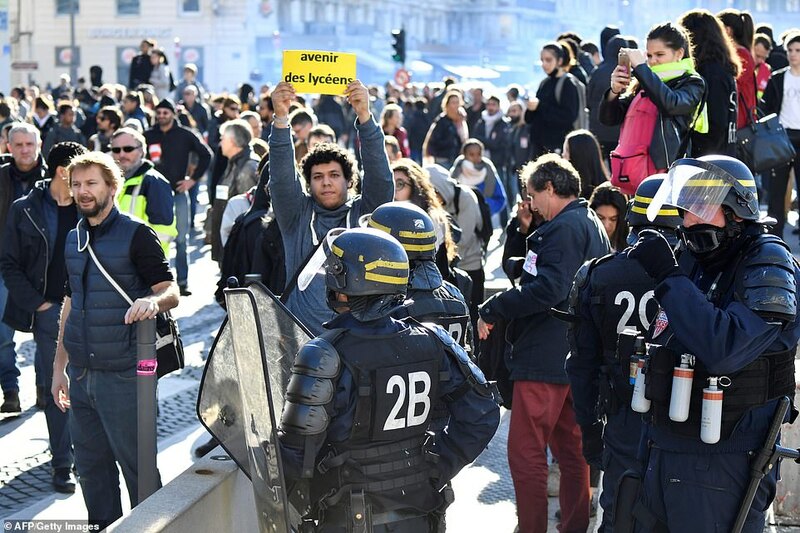 The ‘yellow vest’ protests began on November 17 in opposition to rising fuel taxes, but they have since ballooned into a broad challenge to Macron’s pro-business agenda and style of governing. 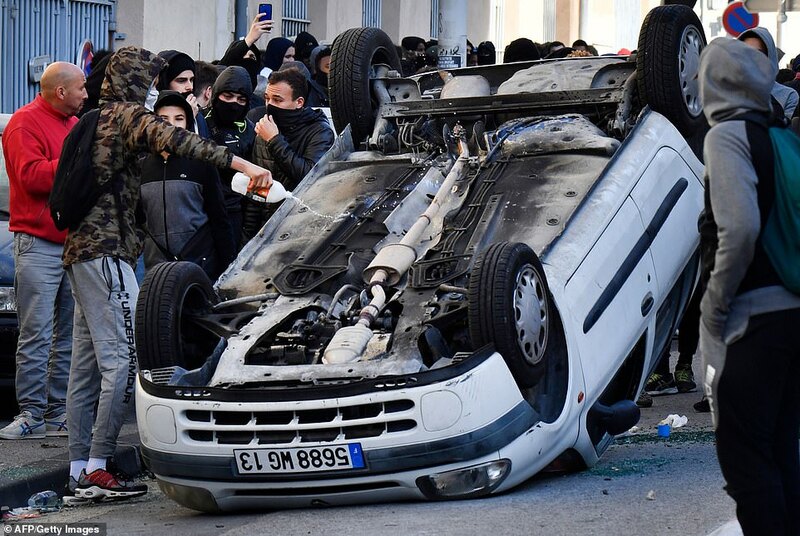 The government announced Wednesday it would cancel planned increases in fuel tax due to take effect in January in a bid to appease the mostly low-income protesters from small-town and rural France. 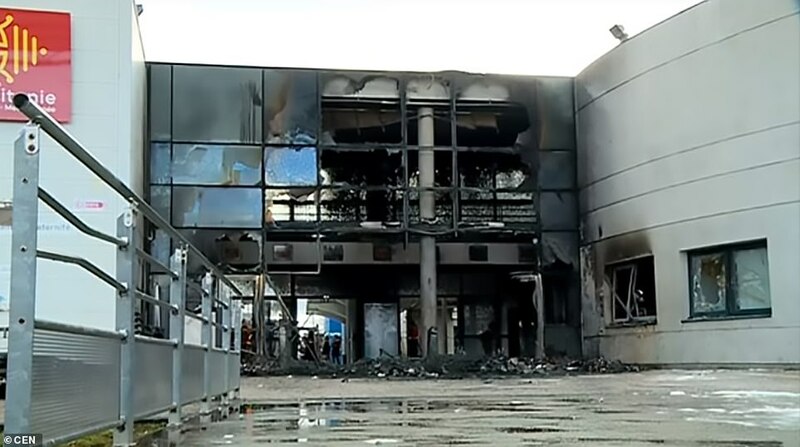 ‘With the yellow vests as a pretext, we’re seeing all sorts of individuals joining with people demonstrating in good faith, including students, and this is leading to serious violence,’ Education Minister Jean-Michel Blanquer told BFM television. 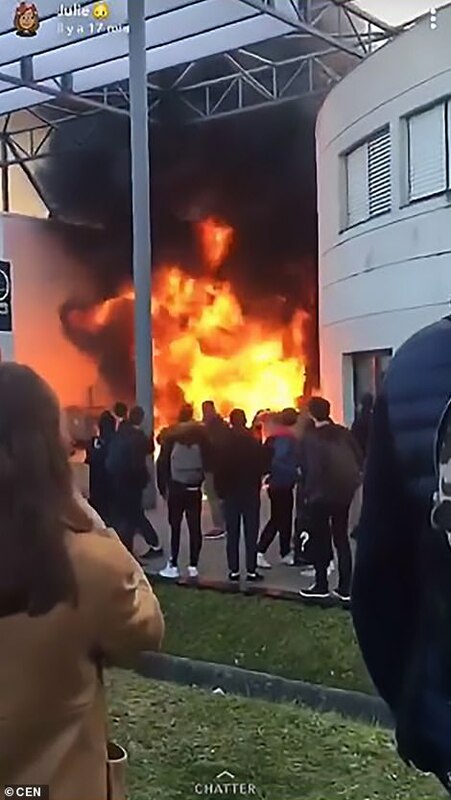 At least two cars were burned outside a school in Mantes-la-Jolie northwest of the capital on Thursday, while a student was seriously injured by a rubber bullet fired by police in the central city of Orleans. The main farmers’ union said Wednesday that its members would hold demonstrations every day next week. 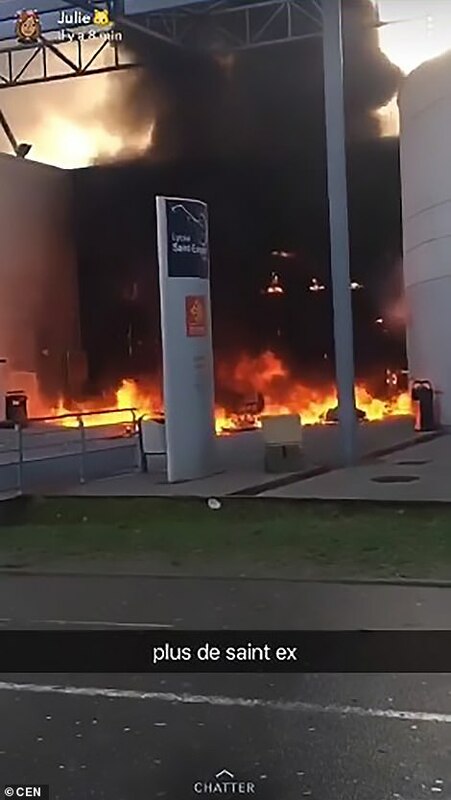 Two truck driver unions have also called an indefinite sympathy strike from Sunday night, while blockades at fuel depots have caused shortages in Brittany, Normandy, and southeast regions of France. 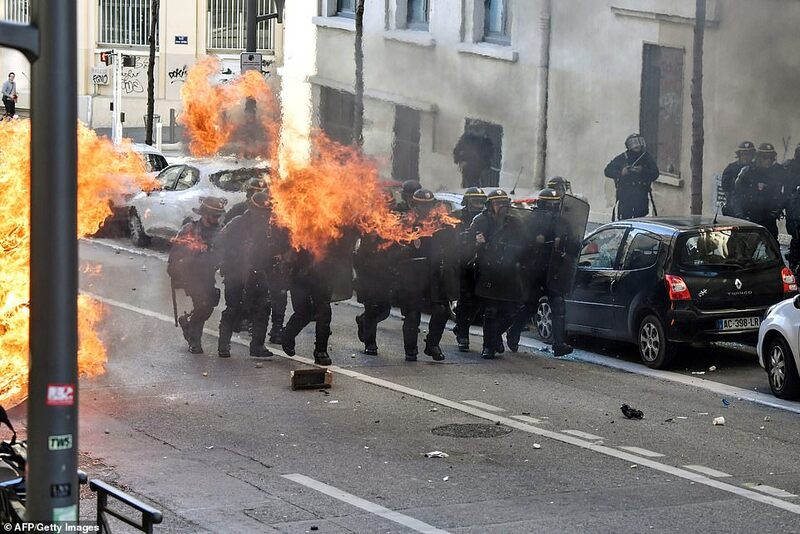 France remains on edge after the ‘yellow vest’ protests degenerated into some of the worst violence in decades in central Paris last Saturday. 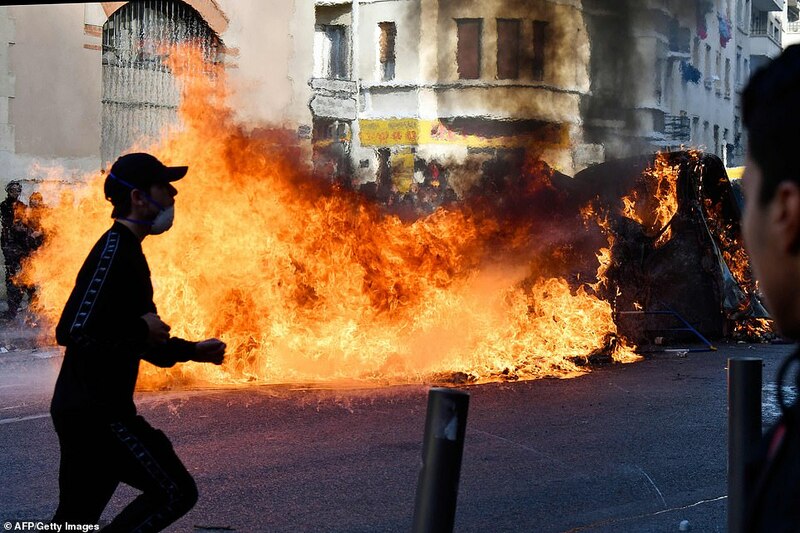 Dozens of cars were burned, more than 400 people arrested and the Arc de Triomphe was daubed in graffiti. 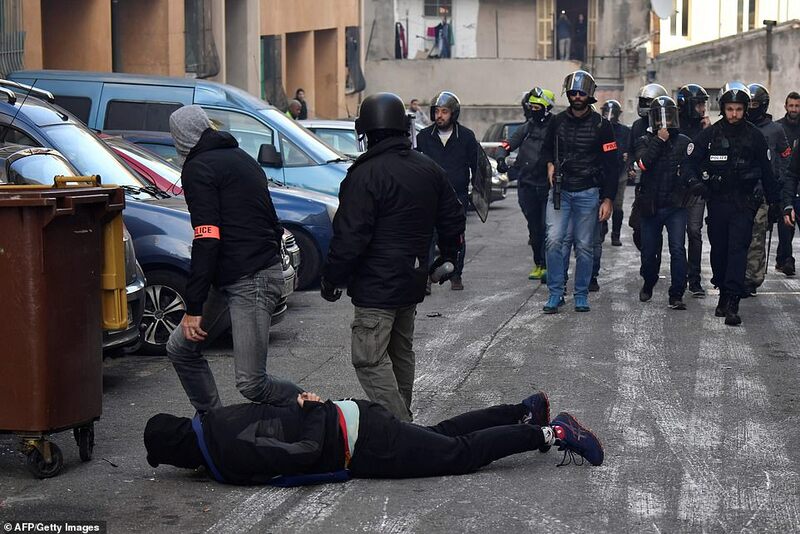 Officials fear more violence this weekend after organisers called for new demonstrations, saying Macron’s decision to cancel fuel tax increases and other concessions were not enough. 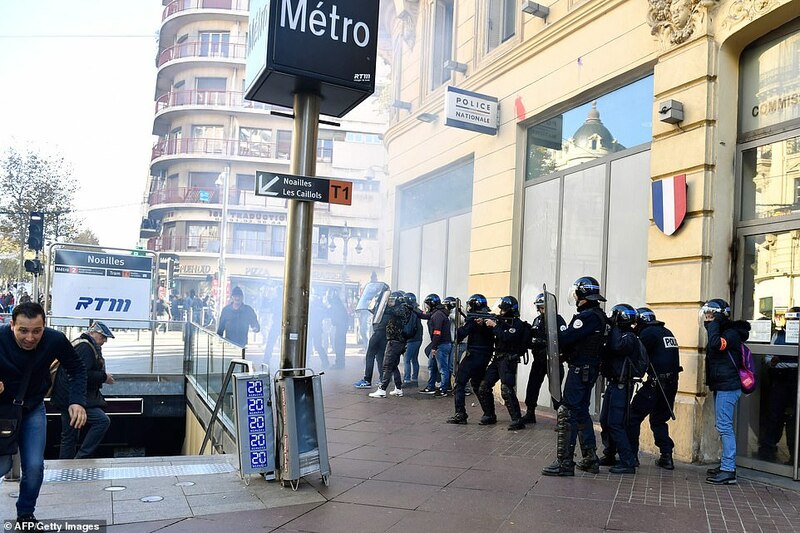 Prime Minister Edouard Philippe told senators Thursday that ‘exceptional measures’ would be in place on Saturday in addition to the deployment of 65,000 security forces across France. ‘We’re asking him to meet us to negotiate on spending power, which is what underpins all this anger,’ Cauchy told AFP. Four people have died in accidents linked to the protests since they began on November 17, and hundreds have been injured. Macron has not commented publicly since Saturday on the deepest crisis of his presidency so far. Since his election in May 2017, Macron, a former investment banker, had styled himself as a resolute and visionary president in the style of famed former French leaders such as Charles de Gaulle. His detractors saw in him the authoritarian instincts of a older historical figure: Napoleon Bonaparte, the 19th-century general who named himself emperor of the French. 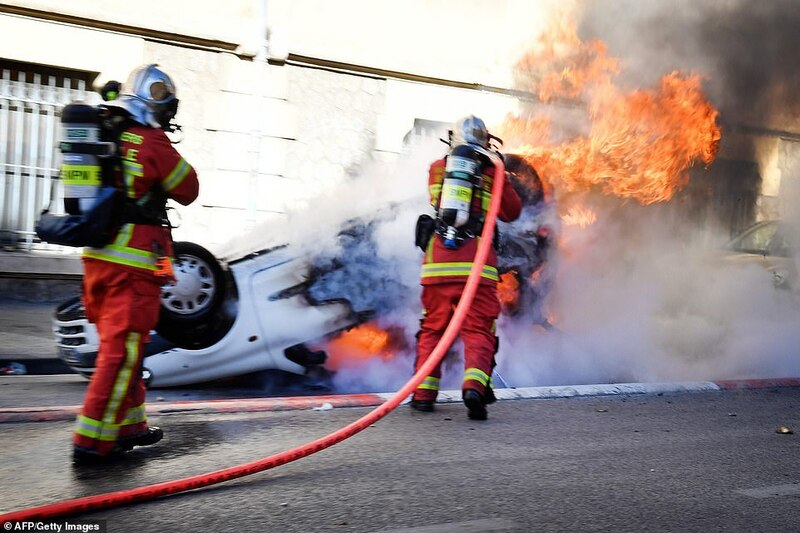 Having abandoned planned fuel tax hikes on Wednesday, a week after ruling this out in a televised address to the nation, Macron has seen his authority and image take a severe blow. ‘The Bonapartist method which was successful at the beginning to launch his reforms is not suitable any more,’ Philippe Moreau-Chevrolet, an expert in political communication, told AFP this week. The protests also come as his government is preparing to push through other contested changes, including a hugely sensitive shake-up of the pension system which is likely to spark fierce resistance. With his political opponents emboldened and protesters sensing weakness, will Macron be able to deliver any more of his vision of a France that is more business-friendly and less dependent on state spending? 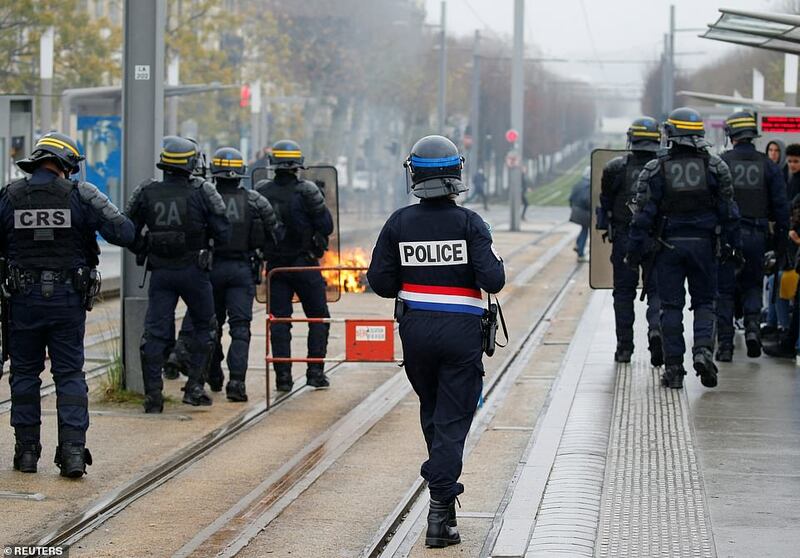 The sight of burning barricades in the street, mass demonstrations and a government in a retreat is a wearily familiar one for observers of France. But for foreign investors and his fans abroad, Macron had provided hope that France might finally put an end to decades of high unemployment and low growth. Overhauls of labour laws and the state railways, as well as tax cuts for businesses and high-earners, passed with relative ease. 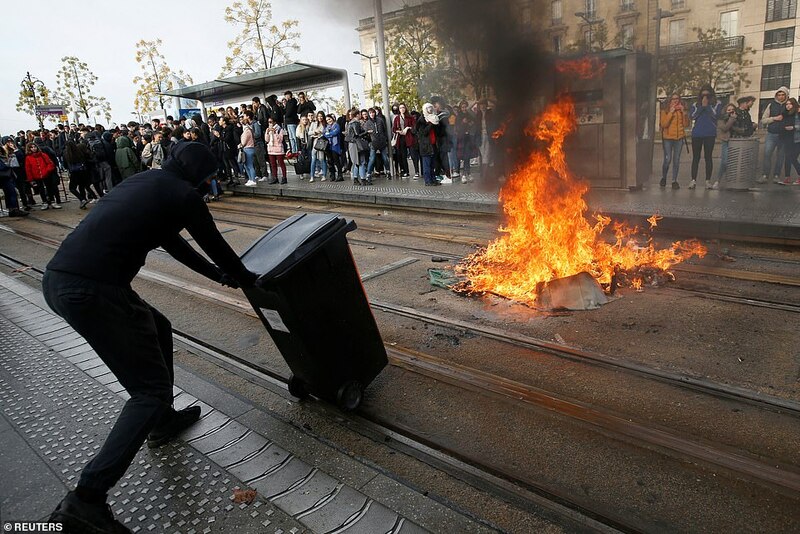 But it is angry street protests that are back, not the image of a ‘start-up nation’ wedded to innovation and technology that Macron envisioned. ‘The attractiveness of France has taken a real hit,’ Economy Minister Bruno Le Maire conceded on Monday. The election of Macron, a pro-EU centrist, bucked the electoral trends around Europe which have seen gains for rightwing populism – something Macron has likened to ‘leprosy’. Since taking office, he has positioned himself within the EU and on the international stage as a leading voice for centrist politics and multilateralism. With European Parliament elections looming in May, Macron said voters faced a stark choice between nationalists like Hungary’s hard-right Prime Minister Viktor Orban and Italian far-right leader Matteo Salvini, and his own ‘progressive’ camp. His side has taken a hit. ‘Macron is not a problem for me, Macron is a problem for the French,’ Salvini quipped this week in an interview with Politico. Macron had named reining in France’s public spending a priority since taking office and had set himself an objective of balancing the country’s books for the first time since the 1970s by the end of his term. The government had a target of reducing its deficit to 2.8 percent of GDP this year, just under the 3.0 percent limit set under the EU’s Stability and Growth Pact. 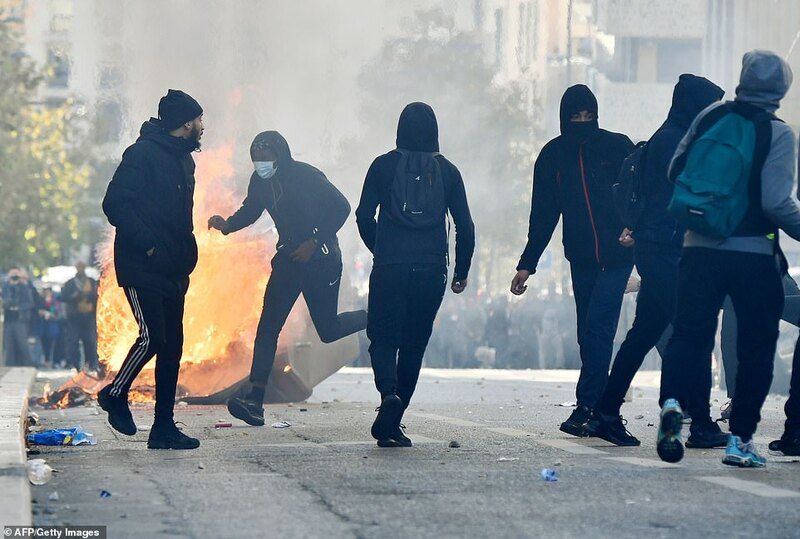 Any further concessions or a decline in economic growth – due to disruption from the protests, falling investment or fewer visits by tourists – will exacerbate the impact of the crisis. The crisis has prompted a new round of soul-searching about France’s fifth republic, established under de Gaulle in 1958, which institutionalised the role of an all-powerful president. The new constitution was intended to put an end to the instability and ineffectiveness of the parliamentary system which emerged in France after World War II. But the French have soured in record time on three successive leaders – Nicolas Sarkozy, Francois Hollande and now Macron – making many observers question the hyper-centralisation of power in the hands of the president. Macron scored just 24 percent of the votes in the first round of the presidential election, pushing him into the final round but leading his most vocal critics to question his legitimacy and his programme ever since. 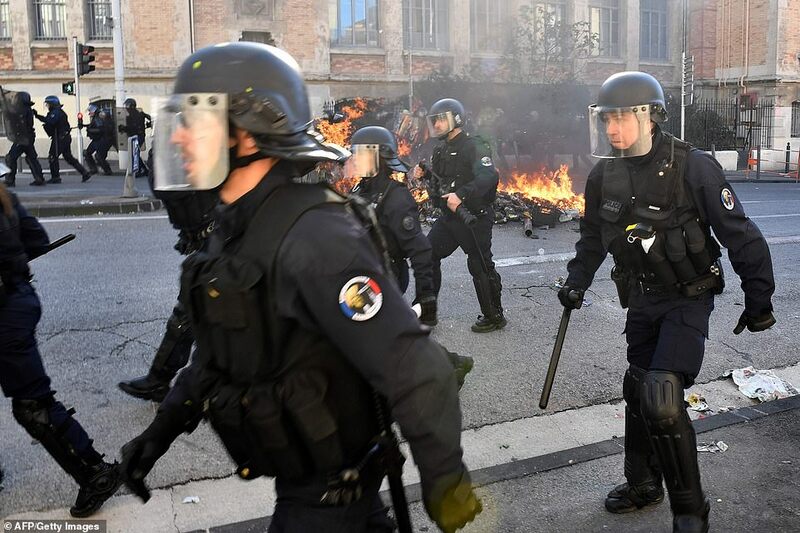 Despite last weekend’s violence, attributed by many to vandals intent on rioting, public support for the yellow vests has remained stable, with an opinion poll this week showing 72 per cent backed the movement. Several museums near the Champs-Elysees and the Arc de Triomphe, which was severely damaged during the violence, said they will remain closed Saturday, and some schools in the area have called off Saturday classes. A Paris Saint-Germain football game against Montpellier scheduled for Saturday has also been postponed after a request by Paris police. Labour unions are also meeting Thursday to weigh their response to the movement, which has billed itself as a grassroots protest unaligned with any political party or union. 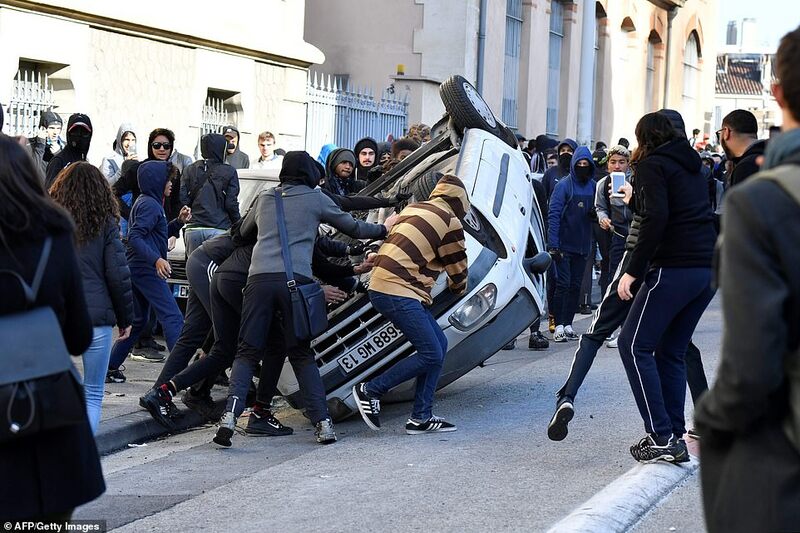 Macron and his government have appealed for calm, and signalled they are ready to make further concessions to avoid new violence after the U-turn on fuel tax increases. But Macron’s office said he told ministers he would stick to his decision to cut a ‘fortune tax’ on high-earners, which the former investment banker abolished last year. Restoring the wealth tax has become one of the core demands of the ‘yellow vests,’ alongside the fuel tax rollback and an increase in the minimum wage.